Broken, stolen or lost car keys? Car Key Assist offer the most reliable car key replacement in Birmingham and across the West Midlands. Losing your car keys can be a stressful experience, so we’ve made our car key replacement service as easy and efficient as possible to make sure you get a working set keys back as soon as you need them. No matter the issue with your car keys, our expert automotive locksmiths are always on hand to provide replacement keys for a range of vehicle makes and models. 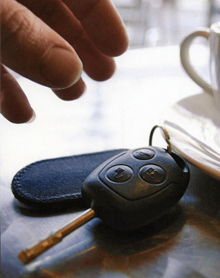 From simply cutting new car keys to providing a newer key fobs, we can help. Using our specialist vehicle locksmith tools, we cut car keys from existing locks to ensure the perfect fit. All vehicles manufactured after 1995 are fitted with an immobiliser, which require a coded transponder key. With the latest technology, we are able to code your new car key properly and make sure you are able to get back on the road as quickly as possible. As well as replacement keys, we are also able to provide duplicate car keys to pattern or to key number in case you need a spare key - from as little as £35. We are able to provide replacement keys and fobs for a range of car manufacturers, including Ford, Vauxhall, Peugeot, Citroen, Skoda and many more. Our shop is located in Birmingham, with access to a mobile van if you need car key replacement at your home or by the roadside. Contact us now to get the best vehicle locksmith services in Birmingham.